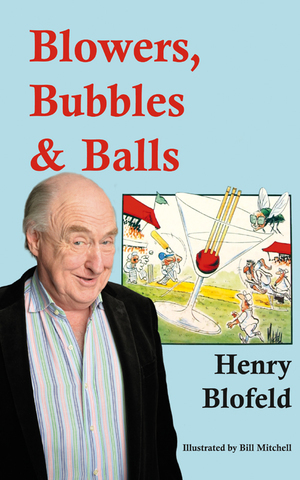 Blowers, Bubbles & Balls breaks away from Henry Blofeld's more conventional journalistic style and is a selection of short stories and anecdotes about some of the more unusual experiences he has encountered throughout his career as a cricket commentator and writer. A light-hearted and lightweight string of anecdotes by international media gadfly, Henry 'Blofly' Blofeld, which has marginally more about wine and women than cricket. However, Blofeld does introduce a few episodes such as his odyssey to the Sydney Hill to meet the owners of the 'Bespectacled Henry Blofly Stand' banner.His stories take the reader around the world and behind the scenes with the cricketing fraternity. From England to Australia, from South America to India and back to the West Indies, Henry tells of his much publicised run-in with Ian Botham, and frankly discusses his relationship with Dennis Lillee. These jolly, jaunty japes and tales are sometimes witty, sometimes racy, sometimes spicy, and occasionally incredulous, but never are they dull.